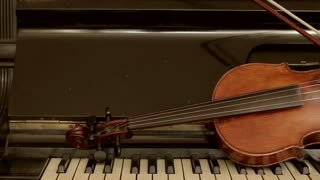 Old violin lying on the piano. Still life of violin and piano. Vintage musical instruments. 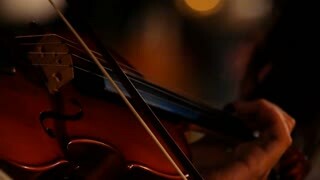 Violin of professional violinist. 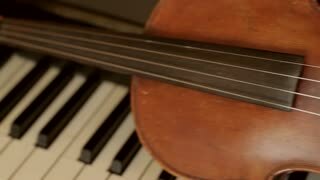 Old violin lying on the piano keys. 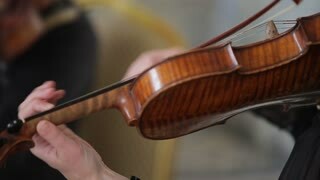 Stradivarius violin. Vintage musical instruments. 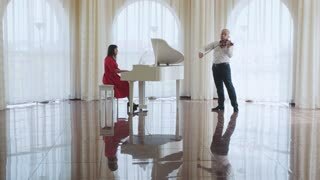 Professional violin. Sofia, Bulgaria - 20 SEP 2015: The camera moves along the stage on which plays a symphonic orchestra. 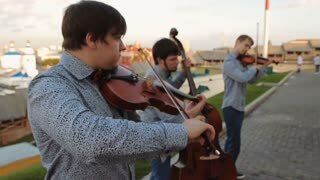 An orchestra is a large instrumental ensemble used in classical music. Playing double bass hand down. Close up of a musician playing a double bass in an orchestra (right hand on the strings). Playing double bass 1. Close up of a musician playing a double bass.